Ascorbic acid, or vitamin C, helps heal wounds, repairs tissue and produces protein to make skin, tendons and blood vessels. Deficiencies in vitamin C may present in the form of gingivitis, dry skin, easy bruising and the inability to fight off infections. Since your body does not produce its own vitamin C -- nor does it store it -- the University of Maryland Medical Center suggests taking 250 to 500 mg of vitamin C two times a day. Check with your doctor before taking any dose of vitamin C and before giving vitamin C to your child. Divide your dosage of daily vitamin C supplement into two to three measures. This allows you to take a smaller dose with each meal. Take your last dose with your evening meal, so you do not take vitamin C on an empty stomach. Taking vitamin C without a meal may leave your stomach upset. Eat fruits high in vitamin C as a late-night snack if you do not take supplements. 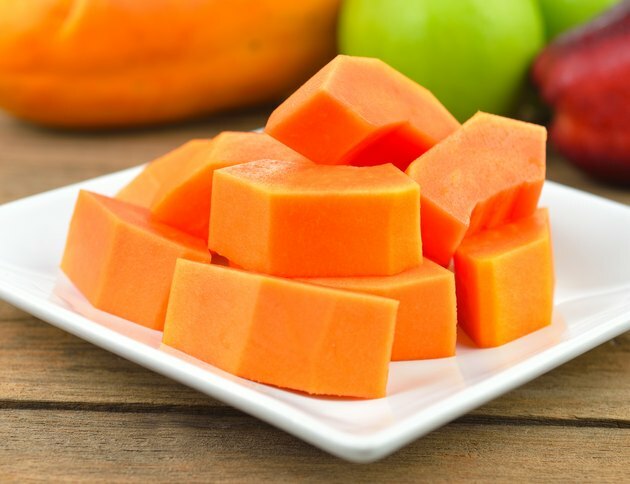 Strawberries, cantaloupes, oranges and papaya provide a range of 130 to 300 mg of vitamin C per serving. Oranges, green peppers, papaya, cantaloupe, mango, tomatoes, cabbage, watermelon and strawberries are listed as excellent sources of vitamin C by the University of Maryland Medical Center. Vitamin C supplements are available in tablets, capsules, powdered crystalline and liquid forms. Buffered supplements are available if other vitamin C supplements upset your stomach. Smokers should increase their intake of vitamin C by 35 mg per day. Taking more than the 2,000 mg a day of vitamin C can result in unpleasant side effects, including diarrhea, vomiting, abdominal cramps, insomnia, nausea, heartburn, headaches and kidney stones. Taking vitamin C with some drugs may cause an adverse reaction. A list of these drugs includes aspirin, acetaminophen, aluminum-containing antacid, barbiturates, chemotherapy drugs, nitrate medications, oral contraceptives, hormone replacement therapy, protease inhibitors, tetracycline and warfarin.